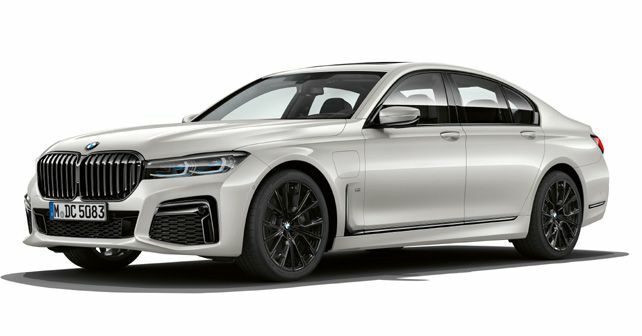 Just days after the 2019 iteration of the BMW 7-Series broke cover, BMW has announced the 2019 hybrid model lineup of its flagship sedan. The 2019 BMW 7-Series lineup has just been spruced up with the addition of two new nature-friendly plug-in hybrid versions, which will go on sale in Europe in Spring 2019. The two model variants in question here are the 745e and the 745Le xDrive, the latter featuring BMW's All-Wheel Drive (AWD) setup. The hybrid powertrain in both the variants remains the same – a 282bhp, 3.0-litre six-cylinder BMW EfficientDynamics engine mated to a new, larger capacity lithium-ion battery pack with a rated output of 111bhp and 265Nm of torque. In Sport mode, the powertrain (electric motor + engine) generates a total of 389bhp and max torque of 600Nm. With these figures, the hybrid versions offer similar levels of acceleration as their IC-based counterparts. The 745Le xDrive clocks a marginally improved 0 – 100km/h time of 5.1 seconds, over the 745e's 5.2 seconds. The new, high-voltage lithium-ion battery pack features higher storage capacity (12 kWh), and in Hybrid mode, both versions are capable of travelling at up to 109km/h purely on battery power. The engine kicks-in only on speeds beyond this figure or if the system senses that the car is carrying a heavier-than-usual load. In Electric mode, the car can reach up to speeds of 140km/h on battery power alone. The hybrid system also features a 'preview' function that can allocate the electric power most efficiently on a pre-planned route. It works with the car's GPS. The electric motor is integrated into the 7-Series's eight-speed Steptronic transmission, which allows it to work as an energy generator during braking and coasting, sending regenerative energy back to the battery. The battery pack also powers the car's onboard network and can even power the auxiliary air-conditioning system. Coming to the electric-only range, the BMW 745e has a claimed electric range of 54 – 58km, depending on driving conditions, while the 745Le xDrive, due to the heavier AWD setup, can manage 51 – 54km on pure electric power. Other than an updated lithium-ion battery pack, the 745e and the 745Le xDrive will also come with new digital services, which offer location options for a driver to spend his/her time in while the car is charging at a nearby public charging station. The car's Sat-Nav will also provide a real-time charging station occupancy forecast. Further convenience is offered through the BMW Personal Assistant, which can take care of the basics like looking for a parking spot or a charging station. However, the new digital services will only go on offer from the Summer of 2019.